NEW YORK — Find your nearest interplanetary gateway! The acclaimed anime series "Cowboy Bebop" is celebrating its 20th anniversary in style at New York Comic-Con. On Thursday (Oct. 4), four creators of the original Japanese "Cowboy Bebop" and two of the show's American voice-over actors gathered at the Jacob Javits Center here to answer questions about the legacy of the futuristic, neo-noir space drama. Sunrise Studios developed the classic anime series that first aired in Japan in 1998, directed by Shinichiro Watanabe. The American and Japanese panelists repeatedly paid compliments to their international counterparts. Each attributed part of their deep connection with the show to those across the ocean. Steve Blum is the English voice actor for the show's lead character, Spike Spiegel. 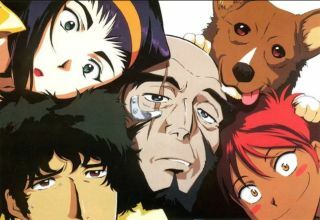 When asked about the success of the show, Blum said, "there was nothing like 'Cowboy Bebop' at the time" in the United States. "It seemed to be a great crossover show because it had so many elements from all over the world that people could connect to," Blum added. In the same vein, scriptwriter Dai Soto complimented fellow series writer Keiko Nobumoto for sticking up for her visions of keeping diverse demographics for the characters in the series. Soto said that having this event in New York was especially meaningful because he sees it as a diverse city. Nobumoto said "Cowboy Bebop"'s success in the United States makes some sense and might be the completion of one big, strange loop. Nobumoto said she grew up watching American shows like "Bewitched" and "Sesame Street," and incorporated some of those elements into her writing. In the episode "Wild Horses," a space shuttle flight plays a dramatic role. Kimitoshi Yamane a mechanical designer on the show, said on Thursday that a fellow creator and "Star Trek" fan wanted to name the shuttle Enterprise. Yamane said Enterprise would have been OK as the name, but audiences who know a lot about spaceflight would remember that the real shuttle Enterprise rode on top of a jumbo jet and had no engines. Columbia was the name designers ultimately chose for the shuttle; the episode aired in 1999, years before the Columbia shuttle disaster that killed all seven crew members in 2003. Unshō Ishizuka, the Japanese voice actor for character Jet Black, died earlier this year. "Thank you, Jet!" Nobumoto said midway through the panel as they answered questions about a series revival. Jet Black is a character born on Ganymede, one of Jupiter's moons. At the start of the event, the panel moderator announced special "Cowboy Bebop" 20th anniversary merchandise. In the series, Spike steered a spacecraft called the Swordfish II. Representatives from Funimation Productions, the American distributor of the series, debuted a new 1/48 model of this red vehicle moments before Thursday's panel discussion began. They highlighted the Exclusive Collector's Edition, which has sold out. You can order an Amazon.com exclusive edition of "Cowboy Bebop: The Complete Series" here.